Plankton, the tiny creatures and plants that drift along with ocean currents, are absolutely vital to the health of our planet. Without them, there'd be no life in the sea. But we don't know that much about them. Their lives occur on such tiny scales that it's tricky to get a good look at how they behave in the wild. So instead, researchers have turned to robots. 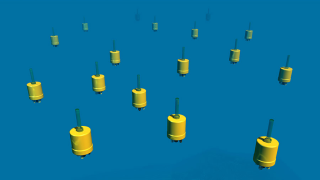 Oceanographers from the Scripps Institute at the University of California San Diego have built a swarm of robots that can imitate the tiny sea creatures at a larger scale. Like their smaller brethren, they drift with the ocean currents in three dimensions. They were built to test a set of theories about how plankton form dense patches below the waves, which then rise to the surface as red tides. “These patches might work like planktonic singles bars,” said Peter Franks, who worked with the robots. His theory is that these patches aid the plankton in feeding, reproduction and protection from predators, but he couldn't test those ideas in the real world because plankton are too small to track. So he used 16 of the larger "robot plankton" instead. The results were almost identical to what he had predicted. The robots formed a tightly packed patch in the warm waters between waves, but dispersed as the crests of waves passed over them. “This is the first time such a mechanism has been tested underwater,” said Franks. What's more, the robotic plankton can now be used to test all kinds of other things - mapping coral habitats, studying the movement of larvae between protected areas and even tracking oil spills. "This swarm-sensing approach opens up a whole new realm of ocean exploration,” said Jules Jaffe, who built the bots.